There should be a minimum on the air pressure but not a maximum. Every game, they're taking air out of the footballs I'm throwing, and I think that's a disadvantage for the way that I like them prepped. You talk all the time about being connected, being a unit, believing in each other. But if you have unnamed sources, people out there cutting you down, and then you find out it's the person calling the plays - that would be really hard to deal with, to look at him the same way. 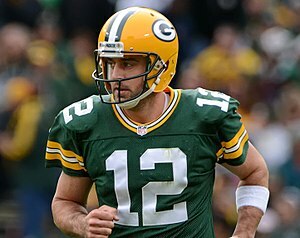 Aaron Rodgers, starting quarterback - that just has a good ring to it. It's named the Lombardi Trophy for a reason, because we play and live in Titledown. We've got the best fans, and I can't wait to go home and see those fans and bring home the Lombardi Trophy. Thankfully we had a big drive there in the fourth quarter after the fumble to put us up 11, and then the big drive to finish the game. Leadership can't be forced or contrived. It has to be your personality. I love our fans. Our fans are so supportive. It's been incredible to end four playoff games with 'Go Pack Go.' It's great at home, they travel well, it's on a first-name basis. It's a special play to play and all of us are blessed to play in Green Bay, and hopefully we will be repaying those fans with the Lombardi trophy. I've always been supremely confident in my abilities. But the biggest confidence boost is when the guys around you, you feel like they have confidence in you.